No Subscription. Cost of food $157.99 plus per week (7 days). 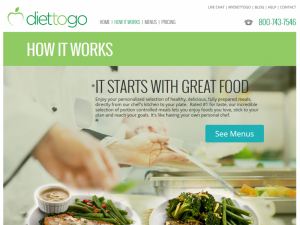 Diet-to-Go is a popular dieting meal program that is freshly prepared, delicious, and nutritionally balanced. Meals are delivered directly to your home—or, you can pick the meals up if you live in one of the more than 200 Diet-to-Go pick-up areas. These meals are rated highly because they’re prepared by chefs and are never freeze dried. The meals also come with extra fruit, sides & condiments—which puts this weight loss system ahead of the curve compared to other systems. This company is really focused on sustainable weight loss. For this reason, Diet-to-Go is a great option for people who want to lose weight or maintain their current weight with a convenient meal plan. By providing healthy meals that are tasty and affordable—especially compared to going out to restaurants or shopping at the grocery store—this company helps customers focus on long-term healthy eating habits. Diet-to-Go offers low carb, low fat and vegetarian diet meals to suit different tastes and weight loss goals. They emphasize safe weight loss through pre-portioned meals and snacks. They also have helpful articles and tips on their website to help you learn more about effective weight loss. Diet-to-Go is affordable, fresh and focused on helping you achieve sustainable weight-loss. You order it online and then can pick it up if you are near one of their pickup areas (Baltimore, Washington DC, Virginia, Philadelphia/New Jersey and San Francisco Bay area). Or, it can be delivered directly to your home. They offer three complete meal plans with diverse menus. All meals are prepared fresh in Diet-to-Go’s clean, commercial, USDA-monitored kitchen. Meals have a four-day shelf life and do not need to be frozen as long as they are consumed within the scheduled time. Meals can be frozen if necessary. You don’t need to count points or calories because all the meals are pre-portioned—and all of the nutritional information is readily available if you need it. The Diet-to-Go system works by controlling your calorie intake with pre-portioned meals and snacks, giving you just what your body needs to achieve a healthy weight—without making you feel like you’re starving in the meantime. The low fat traditional diet meal plans offer a 5-week menu of freshly prepared food that tastes great with no additives. Each meal meets their strict ingredient and calorie requirements as well as conforms to the guidelines of all major health organizations, including the American Cancer Society, American Diabetes Association and American Dietetic Association. The vegetarian low fat traditional diet meal plans also offer a 5-week menu of freshly prepared food that tastes good—with no additives. Like the traditional plan, the vegetarian plan meets the guidelines of many major health organizations, including the American Cancer Society, American Diabetes Association and American Dietetic Association. Many low carb diet meal plans require a complex set of rules and the need to shop for and prepare the food. Diet-to-Go offers low-carb meals with 30 net carbs per day, minus the hassle. Many articles and FAQs are available online for Diet-to-Go clients, including nutrition and product information plus frequently asked questions about plans and packages. Diet-to-Go is a popular and healthy option for dieting. If you want to lose weight by making healthier food choices—with the added convenience of affordability and delivery to your door—then this might be the system for you. Even if you’re not focused on weight loss, but instead are just interested in maintaining a healthy weight, Diet-to-Go is a healthy, tasty option! Remember Diet to Go has a 100% satisfaction guarantee. They have no membership fees, only the cost of meals. Orders are prepared fresh and never freeze dried. They have over 200 pickup locations on both coasts. If orders are delivered some of it may be frozen. Meals include the little extras like fruits, rolls and sides and even the condiments: fruit preserves, low-fat cream cheese, ketchup, mustard and low-fat mayo. 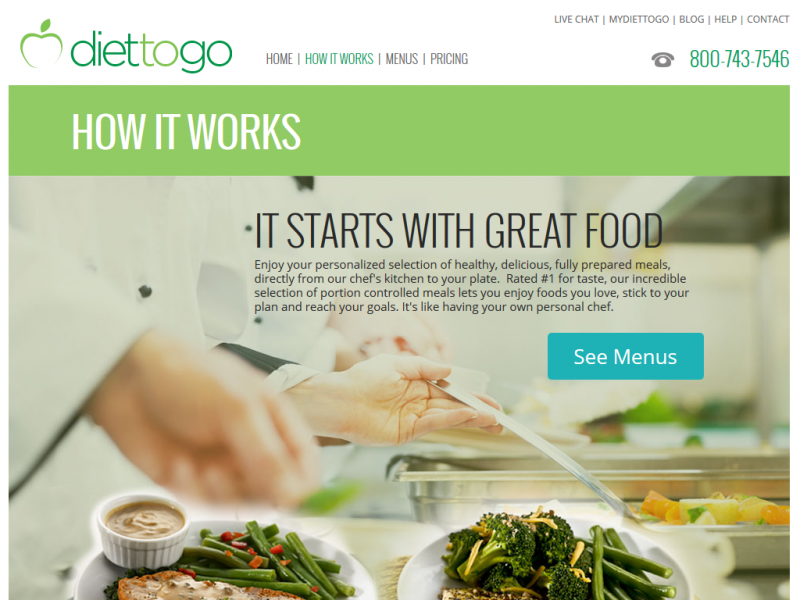 Diet to GO has a variety of meal options and frequency to fit any budget. The Low Fat Diet Meal Plan and Low Fat Vegetarian Meal Plans follow the dietary guidelines of the American Heart Association, American Cancer Society and the USDA Food Pyramid.